The house exceeded our expectations and helped to create some wonderful new memories . While the house is on the older side it is very well maintained and views and location just put it over the top. It is so close to the aquarium that we actually walk there while it was raining without getting soaked. While sitting on the balcony we got luck enough to see multiple whales breach the the surface. Sea lions, otters and whales…oh, my! You'll have ringside seats to view Monterey Bay's amazing sea life from this oceanfront "duplex," just a few blocks from the Aquarium. Rented together, these two units provide sleeping for eight in four bedrooms. There are three bedrooms and two baths upstairs and another bedroom with a bath in the separate apartment below. (This private, self-contained unit has a second kitchen, living room, and dining area.) And there's a protected patio with a barbecue out back where the whole group can gather. The location is ideal for exploration - walk to Cannery Row on the Coastal Trail, or head out in the opposite direction to Lover's Point - a lovely, protected cove with a white sand beach. Walk to outlet shopping, restaurants, boutiques, galleries, and nightlife. Rent a bike or a kayak. Tee off at one of the Peninsula's innumerable golf courses. Or just take a seat on your balcony and enjoy the show! We loved the accommodations. Perfect location and ideal space for a group of 8. Any concerns, questions or issues that arose we quickly addressed. Would definitely stay here again. Cant wait to come back. Spent 4 days with my grown children and their young families at this breathtaking location. Property is in immaculate condition and very well stocked. Highly recommend. Our rental exceeded our expectations. for four adults and two small kids it was a perfect place. The house was charming, with a spectacular view of the Bay that made us want to stay there all day, watching the seals and the fishing boats.Everything was spotless, and the house was well equipped for all needs (except a flower vase).The king size beds in two of the bedrooms were much appreciated, since we had been afraid they might only be queens. The kids loved the twin beds in the third bedroom.Great location, smooth service - Thank you. We were a group of high school friends celebrating our hallmark birthdays. Baywatch was perfect, we loved it the moment we arrived. It was clean, and had all the supplies we needed. The view of the bay from the front area was breathtaking. We could sit at the table and have full view of the scenery. The seals were pupping, and there was a lot of activity. The walking path offered us the town at one end, and Lovers Point at the other. The location was great. We traveled to Big Sur one day, 17 mile drive, and Carmel, the following days. All were easily accessible for this Monterey Bay location. We all would highly recommend this property. "BAY WATCH"Where do I start?... Six 'Sisters' rent a place yearly, to get together and enjoy the Pacific Coast. BAY WATCH consists of two units, with two separate street entrances. One door leads upstairs to a nice living room, kitchen, master bed/bath; two other bedrooms and a second bath. The second door leads into separate, private 'guest quarters', on ground level, with kitchen, livingroom, bedroom and bath. This place is AWESOME!! Out of all the places we have stayed over the years, this is now our new favorite! Feels like 'home away from home'!Picturesque views of the beach and ocean can be enjoyed sitting in the upstairs living room or standing in the kitchen, through a full-wall window, as well as from outside on the balcony, with unobstructed views of the Pacific, and enough chairs for all to sit. You can see seals, surfers, fishing boats, etc., at any given time. This place seems to be very popular. As some people jogged or walked the beach, many stopped and waved, or just took pictures of our place. I could go on and on, and still leave something out...There were so many special touches, such as how the towels and even the toilet tissue were folded, like on cruise ships. In both units, there were comfortable beds with ample, plush towels and linens. All bedrooms and living areas have TVs. There is a full array of dishes, cooking and serving utensils. Really, all you need is your food and drink. Everything else is amply supplied. The weather was glorious, but one chilly morning, we lit the fireplace, curled up on the sofas with cocoa and coffee, and quietly enjoyed this wonderful place. This was our second time renting from Monterey Rentals. Kyle was so nice, and helpful from the very beginning, even following up later, to make sure we enjoyed our stay. These are the Pros! Their rental process is seamless!! They have thought of everything! You can't go wrong here!We will definitely be back! "Bay Watch" is a beautiful rental in Pacific Grove. It has a direct view of the ocean. It was clean, comfortable and well-stocked. Kyle was helpful in answering our questions. This our first experience to rent a home vacation in USA. We truly loved the experience, the house and the sorrounding area. I believe this house is among the closest to the shore in this area. The view of the bay/ocean from balcony and dining hall was spectacular with direct view on seals lying on shore. The house was super-clean and well equipped with all home/kitchen necessities. You only need to buy your food and drink groceries. Beds were very clean and comfortable. The car garage was spacious enough to contain my oversize Chevy van. Rooms/house decoration and furniture were so beautiful and in perfect match with a sea-type accommodation. We really enjoyed walking to Monterey bay major attractions and restaurants which were located at very short distance from the house. Go for it.....the value truly worths the cost. We rented the beach house on Ocean Ave. in Pacific Grove for 2 days while visiting for my daughter's wedding in Carmel. The house is perfectly located, across the road from one of the most breath-taking views you will ever see in this area. The beach is a sanctuary for harbor seals as well. The house has two units available. The second-floor unit has a double-pane glass window that runs the length of the kitchen/living room and offers a fantastic view of the bay! Both units are well-appointed, clean and very comfortable. I would definitely stay here on my next trip to the area. Nice, cute, well-appointed beach cottage house in perfect location across from the beach with spectacular views. Relaxing quiet neighborhood. It was exactly what I had expected-- clean, comfortable and great for families, friends and couples sharing. We were so glad we rented the beach house off of this website because everything went well! The house was beautiful and clean! The view was priceless and was exactly what we read and saw on the website. Kyle was so kind to us and everything he sent us was very clear. We never had to second guess about anything. We would definitely rent through this website again and stay at the same beach house! Thank you! Bay Watch is all about the spectacular views and great location. Every bit as good as advertised! The Monterey Bay Aquarium and many restaurants are within a five minute walk. Sea otters, sea lions and harbor seals provide entertainment that is enjoyed from the living room. The very comfortable living room and nice gas fireplace kept everyone cozy during the course of a stormy day. As there were three couples in our group, we were also looking for a rental with 3 queen or king beds and 3 bathrooms. Although the bedrooms and baths were not large and fancy, they served our needs very well. We would definitely return for another stay at Bay Watch. My daughter was getting married at the Monterey Bay Aquarium. We rented Bay Watch for relatives, many of whom were traveling from the east coast. They could stay only for a long weekend, so I wanted their lodging to be extra special. Bay Watch was everything I had hoped for--exquisite views, close to the water so they could hear the crashing waves, and so much more. It is an easy walk to the Aquarium, Cannery Row and downtown Pacific Grove which has many wonderful restaurants and shops. The house is spacious, well-equipped, and very clean. Its layout affords both privacy and gathering space. My family thoroughly enjoyed their stay! Can not beat the views! This is the second time we have stayed here and it fits our group perfectly. Plenty of space, comfortable beds and the VIEWS! What a fantastic way to wake up every morning and end the day with cocktails on the deck. We love this house!!! Bring some food and you are ready for your vacation!! Bring your binoculars, because you are just not going to believe all of the wildlife you'll be able to see from those gorgeous windows! Even at night with the moonlight lighting up the ocean it was a spectacular sight to see...so peaceful and relaxing. The home was really outstanding--loads of extra blankets and pillows in every room, fans for warmer days (unusual here), loads of linens, and everything in the kitchen you could ever want or need. There is a combo of plastic and glass bowels and plates now, obviously thoughtfully added from a previous review. The couch holds a lot of people and the fireplace adds some nice warmth in the morning as well as great ambiance. The home has a wonderful beach house home vibe that is so relaxing. We brought a card table along and set it up in front of the window to work a puzzle on--leaving the main table free for meals. Cannery Row is literally STEPS away, and the walking trail is directly in front of the house. You can't access the beach directly in front of the house--I think it's part of Hopkins Marine Reserve--but you can if you take a walk on the trail to find beach access. Bring something to wear at night because you'll want the curtains to that beautiful view open day and night. With one car in the garage, the smallest car in the driveway (it is a short driveway and the car can't overhang onto the sidewalk) and two parking passes we had no problems with cars being close by in this busy area. I hope that one day they remove the unused breakfast room and add bunk beds or blow out the wall and make an even larger great room. Our whole family felt relaxed here, and even though one pair was in the downstairs unit everyone wanted to be upstairs, so we all felt connected--like we wanted to be. Neighbors are not rental units so the area was nice and quiet at night. This is not the place for loud gatherings or parties. We will be back!! The home is in a beautiful location. However, there were a few things that made us give this only 3 stars. The home was not stocked well with "extras." We rent a home every summer and the homes are always stocked with essentials in the kitchen pantry as well as the bathrooms. There was none of that in this house! We had to purchase paper towels, etc. They didn't even have salt and pepper! We had to wash towels daily due to the fact that there was never enough. The gas grill in the backyard was out of propane and the temp never worked on the grill making us cook inside. The outside heater was broken so we couldn't spend time in the evenings outside in the back. The houses surrounding ours were very well maintained and I wish we could've said the same. While the inside was nice, the outside of the house needs some attention. Chipping paint, etc. A beautiful home with a magical view!! We had such a wonderful time during our stay at the Bay Watch rental! We came in from Colorado for the Big Sur Marathon weekend. As other reviewers have noted, the view, THE VIEW! We saw Dolphins, sea otters, and even orcas off our balcony! That alone is enough to give the home five stars, and we have rented a great deal of vacation homes in beautiful locations.The home itself is perfect for what we needed- we have four kids who eat like a pack of wolves- plenty of space and the kitchen/home had everything we needed. Only thing I would change is the fact that all dishes are glass (three of my four kids are active boys- yikes) and some updates in the bathrooms and linens. But, really, I was 100% satisfied and would most definitely stay there again! 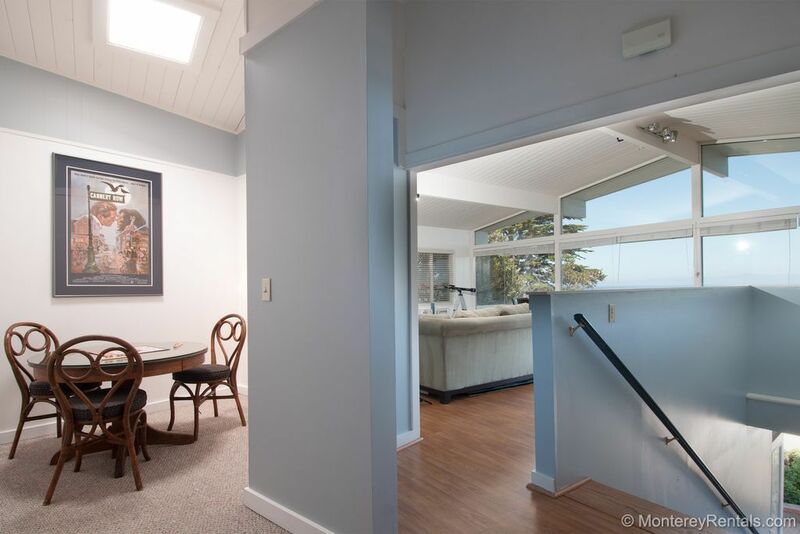 This property has an outstanding view of Monterey Bay and is a great location near Cannery Row with great walking path. Having two separate units was very convenient for us. Everything is well-maintained and well-supplied. Negatives: Window screens were missing, so it was hard to cool off on hot day. Ants invaded, and two calls were ignored. If this is a common problem, please warn the guest. Three extra fees were assessed that weren't mentioned on the original website: housekeeping, $282; reservation fee, $49; utility fee, $30. We pride ourselves on responding to maintenance issues 24/7, so we are very sorry you had to endure an ant invasion—and we're investigating the cause of the phone breakdown to ensure it doesn’t happen again. As far as our fees, we can’t show a breakdown on the home page because the charges are calculated on the length of stay. Once you enter dates, our website displays the total price. The complete breakdown (nightly rate plus additional fees) is shown on both the check out page and on your confirmation. My family of eight, including a toddler, spent the Thanksgiving holidays at Bay Watch. The house is spacious, fully stocked with everything you might need, parking is easy, and it has a view of the bay that extends across the length of the house. We saw whales, dolphins, and sea otters without leaving our house! It is a short walk to the aquarium, museums, and restaurants, beautiful during the day and well lighted at night. A few small housekeeping items were taken care of right away. This is an excellent place to stay and we would definitely consider a return visit. This is a terrific house - spacious and well appointed with a wonderful view of the Bay. It's also convenient to the Aquarium and to walking through town. All of us - ages 4 to 66 - were comfortable and enjoyed our stay immensely. This house has an AMAZING view!! Watching the waves crashing over the rocks and the seals on the beach was amazing. You cannot get a better view. The house was very clean and the location was also ideal. Walking distance to Cannery Row, the Aquarium, restaurants, and grocery store. The only reason that I didn't give it 5 stars is because the linens were a little disappointing and the house was a little weathered but you have to consider, it is on the ocean. The pictures show a telescope which was not there. I wish we would have brought binoculars. All in all it was great. I would rent this house again. Did I mention the view was great!!! Baywatch exceeded our expectations. The views from the balcony are the best on Oceanview Blvd. The house itself was very clean, well stocked with all the essentials, tastefully decorated and very comfy. It has the perfect location and is a short walk or bike ride from all the attractions. Truly a beauty! We look forward to renting this place again. Some friends and I rented the house for a weekend to attend a wedding. The location could not be better. Right on the water, easy access to downtown Monterey, but still quiet and calm. The house itself is fantastic; however, the front porch could use a few repairs and some paint. Overall, it was a great weekend and I would definitely rent the house again if we were to return to Monterey. The Baywatch home in Monterey was by far the best lodging we experienced on our 9 day Northern California trip. The house was clean and well equipped with everything we needed. The view was spectacular of the nearby cove with many harbor seals. The home is only a few block away from the Monterey Aquarium and close to many shops and restaurants. Awesome experience! We stayed at Bay Watch for our daughter's graduation from CSU Monterey Bay. It was the perfect house for a large extended family, with my parents in the apartment downstairs and the rest of us up. We hosted a wonderful party with everyone taking a turn enjoying the views from the deck, which included whales, harbor seal pups, otters and dolphins!We will definitely be staying here again! Great house to share with friends or family. Not fancy but very comfortable and the view can't be beat! The house is well appointed and surprisingly large. There was more than enough space for the 8 of us that stayed at the house. The open concept living/dining area allowed for our family to comfortably be together in one room - and the view from the living room is magnificent! The deck is located just off the living room and faces the ocean. My niece and I enjoyed our coffee on the deck every morning as we watched the large rollers crash against the rocks. Also from the deck, we watched the harbor seals and their pups resting on the beach and playing in the water. The house had abundant hot water, even when we were using 2 of the showers simultaneously. The best thing about this house, besides the view of the ocean, is it's location. The aquarium, grocery store and many restaurants and shops are within a 10 minute walk. And, the bike/walking path along the coast is steps away from the front door. A wonderful place to stay and a great find. I would highly recommend this house and would stay here again. Superb location and the house was clean with a great layout! This is the second year in a row my family stayed in this home and we would do it again! The location is ideal, the flow/layout of the house was wonderful, and everything felt neat and clean. Loved having access to park in the garage and having street parking with permit was convenient. Lovely, simple décor was inviting. I'd recommend new windows since the rooms were very drafty at night and the heaters didn't work well. Also, extra blankets, pillows, and bath towels beyond what was provided would be helpful to allow for flexible sleeping arrangements with kids in the house. Overall, though, we greatly enjoyed the house for a second year in a row! Many thanks! Great set up. Good for family that wishes to have family dinner and socialize/play games after dinner. Definitely would recommend the location and set up. We'd return for sure. The huge windows allowing a fantastic view of the surf was by far the best asset of this house. We sat and/or stood in front of those windows most of the time. Went for a family girls weekend and had the best time ever. The house was beautiful and very clean. The view from the living room wall to wall windows was outstanding. The location near cannery row and outlet stores was great, walking distance. Only thing that could have been better was if there was a DVD player in the main living room. Would definitely stayagain. We really enjoyed our stay and the house was very well appointed. The lower level apartment was perfect for our group. Very clean house and incredible views! Highly recommend this house and a return visit. I have already recommended this property and agent to several friends. The property was all it advertises and the location for us was excellent. It was close the the water, restaurants and shops we wanted to visit. The property gave us convenient and quick access to the golf courses we had booked. It was clean and contained all the supplies and tools we needed. The only suggestion is to look at the TV in the main area. It quit at one point and we had to call the maintenance people who mentioned it had done the same thing to the previous renters. Other than that it made our holiday and experience a great time and allowed us to to enjoy the area and the scenery. We would all come back and want to rent the place. Maybe next time with our wives. just what the doctor ordered. Rest, Relaxtion, in a beautiful ocean front home. one of the best vacation homes I have ever had the pleasure to stay in. I highly recommend BAYWATCH. We traveled to Monterey for my son's wedding. My parents had the downstairs apartment, and my brother's family and I took the upstairs unit. My nephew was so excited about the telescope and the seals lounging on the beach across the street! We could not have asked for a prettier view! Also just a short walk to the Aquarium. The weather was perfect the entire time, and the house was great! Very clean and well furnished. I told my family that if I win the lottery, I'll buy the house for them! We would definitely love to come back. The wedding was at the Bayonet and Blackhorse Golf Club and was really beautiful. The fog didn't roll in, and we were able to enjoy a gorgeous sunset! I would definitely recommend Bay Watch! Baywatch is a beautiful property with an amazing view of Monterey Bay. Windows in full width of the house and balcony lent an unobstructed view of the bay and those beautiful crashing waves. We spent 4th of July weekend celebrating my husband's 50th birthday with a group of friends and family. Baywatch having 2 units accommodated us well. Large living area in the main unit with a large comfy sectional and again those beautiful views. It is within walking distance of cannery row and only a couple short blocks to the outlets. Our group strolled from Baywatch to The Monterey Plaza Hotel and back... it was a beautiful walk. Plenty of parking which was unexpected. Our guests are already asking..."when can we go again"? Montereyrentals was very easy to work with and we give Baywatch 5 stars! As much or more than we hoped for. Well located, very scenic view, and well furnished for our stay. 60th Anniversary with family. Great place. Location and view are amazing! Would have given an excellent rating except they charge the $1,000 security deposit to your credit card and it took a month before they issued the credit. So basically unless you want to pay your credit card company interest you need to pay the security deposit and wait for the credit the following month. Have never had that happen before. Usually a hold is just applied. We share your opinion of Baywatch - the view doesn't get much better than that! We charge security deposits 7 days before arrival and refund them within two weeks of departure (you departed on 3/30, and your card was credited 4/14). However, we've recently instituted a $49 Accidental Damage Safeguard as an option to security deposits for stays under 30 days. Please visit us again soon! This home has huge windows and a deck that overlook a beach with seals and waves crashing on the rocks. Can't think of a better way to start and end the day. Kyle and the Monterey Rental team made payment and checking in/out a snap. The home is very well maintained and close to everything. I cannot recommend this property highly enough and would love to visit again soon! Wonderful View! Even an Elephant Seal! We had a great (4) sibling & spouses reunion. We even saw an Elephant Seal on the beach, which is not very common in this area. Also, there were lots of harbor seals at this beach/cove.The view was outstanding. Great location for walking to the aquarium, Cannery Row & Fisherman's Wharf. The home was very clean and nicely appointed. Being a high end custom home builder, I did notice that much of the bath and kitchen fixtures were a bit low budget but were in good working condition and nice looking. The only three complaints were: 1) The Xfinity controls would not allow you use the "guide". 2) Garage door opener did not have a remote for our car... and the mounted remote keypad opener would only open the garage door, not close it. You had to go inside the garage and actually hold the button continuously until door was closed then go back thru the entry and back into your car. 3) Back patio was not very cozy or clean and the only BBQ I saw was a mini (tailgate) charcoal Weber. Definitely not big enough for an 8 person rental. 4) The neighbor's outside light on the north side of home shines very brightly into the the two bedrooms (upstairs and downstairs)all night. Felt like I was sleeping during daylight hours. I would recommend some "black out" curtains or blinds to resolve this issue. The current blinds are two thin and block very little light. (Three stars on "Comfort" because of this issue. We love watching the seals across the street from Bay Watch, too! Almost all the issues you mentioned have been resolved: there’s a new stainless steel barbecue, new patio chairs and a table, and the owners did a lot of cleaning up in the back yard. We found that the garage key pad does work properly, and we do issue the garage remote upon request. Unfortunately, the missing TV guide feature is due to the fact that there is no space to install a DVR style cable box (I’m still looking into solutions). And I can’t adjust the neighbor's house lights, but I will encourage the owner to install light blocking shades in the affected bedrooms. Artfully designed and decorated small house. Perfect for 1,2 couples or small family. Walk to all attractions and essentials in PG and Monterey. Short drive Carmel. and Pebble Beach. Thoughtful and efficient owner/manager. Watch for whales from your living room! We stayed at Bay Watch for a week after Christmas and had glorious weather. Bay Watch is wonderful house in a fantastic location. We were able to spot whales from our living room! The house is well stocked with supplies and very comfortable. The unit downstairs was a perfect place for the teens to get away from us adults when needed. Bay Watch is across the street from a protected marine sanctuary where you can watch the elephant seals and sea lions lying on the beach. It's within walking distance from the aquarium and a grocery store.Check in was super easy; Kyle at Monterey Rentals was very helpful and congenial. Bay Watch is definitely a place we would book again.